Break out the salami and provolone to make this hearty, deli-style Salami Italiano sandwich for one. Spread cut surfaces of sandwich roll with mayo; sprinkle with Italian seasoning. 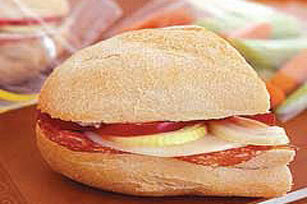 Fill roll with salami, cheese, onion and bell pepper. To make a Super Salami Italiano Sub, add OSCAR MAYER Sliced Ham or Turkey, lettuce, tomato and a sprinkling of KRAFT Grated Parmesan Cheese to the sandwich. Serve with fresh crisp CLAUSSEN Pickles, baby carrots and celery sticks. Substitute KRAFT Light Mayo Reduced Fat Mayonnaise, KRAFT Mayo Fat Free Mayonnaise Dressing, MIRACLE WHIP Salad Dressing, MIRACLE WHIP Light Dressing or MIRACLE WHIP FREE Dressing for the mayo.